Young entrepreneur Gavin Brady (centre) arranges his display for his business, Midloch Farms, as part of a trade show at Staples in Cobourg. Brady is one of nine young people chosen for the Summer Company program run by the Business and Entrepreneurship Centre under the auspices of Northumberland County. Greg Powles (foreground) reviews his hand outs for this First Line Hockey school. Each person will receive a $3,000 micro grant, business training and mentorship as part of the program. Photo by Robert Washburn. 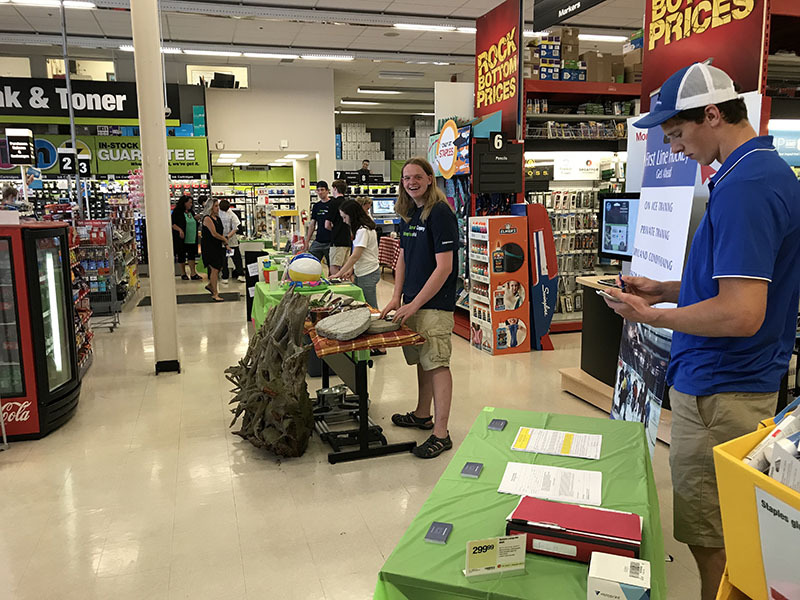 A group of young entrepreneurs got to show off their ideas at a unique trade show at Staples in Cobourg on Wednesday. This next generation of small business operators, ranging in age from 15 to 23, were part of Northumberland County’s Summer Company Program, run by the Business and Entrepreneurship Centre. The ideas range from something as simple as a fresh vegetable business to tuck shop to an online antique shop. The nine young people from across the county had to provide a completed business plan and a viable idea in order to get a $3,000 micro grant to start their enterprise. An average of 40 youth apply each year. Since 2001, when the program started in the county, 135 successful businesses have started. The program is funded through the Ontario government.